RT might cover it better along with the kaiser report. It gets really scary when you tie in all the other things that are happening. The assaults on the poor and disabled (not just in the UK), the attack on the welfare state, and of course the privatisation of the NHS. And that’s just a few examples! On the attack on the welfare state, please see this: http://www.leftfootforward.org/2013/06/jp-morgan-wants-europe-to-be-rid-of-social-rights-democracy-and-employee-rights/ . Full details, straight from the horse’s mouth, are here: http://culturaliberta.files.wordpress.com/2013/06/jpm-the-euro-area-adjustment-about-halfway-there.pdf . I never thought I’d share an opinion with Zak Goldsmith, but it was he who called Osborne a “corporatist”. This Trade Agreement has been fast tracked because no elected, democratic government would give it consideration. Would they? This is an easy sell for protest to those on the left; to those on the right you may want to point out that this agreement essentially over rules Royal assent as corporations can essentially veto national law. This should be sold as an unpatriotic treaty that makes the problems of EU membership look like a grain of sand in the Sahara. If this unelected government pass this into law they become traitors to the Crown. This isn’t more of that ‘Freemen of the Land’ stuff, is it? WELCOME TO THE NEW ORDER! DON’T SAY I DIDN’T TELL YOU SO! This is a deal between the EU and the US, Salmonds plan is for Scotland to remain in the EU. Independence has no bearing on this. Sparky, we have to get it through to the YES party that this needs to be urgently dealt with. I’d prefer we were out of the EU altogether, and that might come with the next Scottish Elections should we win Independence. However, the YES party needs to know about this as well as the Politicians for the whole of Scotland, as we only have the one conservative and he’ll be on his way out soon. We need to make it clear to the Conservatives, that they will be banished to the outer darkness politically if they do this. The only thing they care about is their seats. I’m not against trade, btw. I am against corporations taking over government without being voted in and effectively jamming the ship of state’s rudder on a permanent rightward turn. 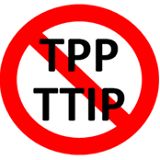 Mike’s blogged on the TTIP before, and it is a very real danger. Unfortunately, trade agreements like it have been formulated for years, as I’ve also commented in relation to Mike’s posts on this subject. They’ve been kept very well hidden from the public. Lobster reported how one of these agreements was effectively signed by EU officials in an office tucked away in the Paris backstreets, with extremely little coverage, if any, from the press or news media. When one young woman raised a question about it on that week’s question time, it threw Jack Straw, who was one of the panellists. He really didn’t know, or didn’t claim to know, anything about it. And so our freedoms, and the right of our states to govern on behalf of their citizens, are slowly and surely being ground away. I’ve already blogged on the similarity between the present day and the collapse of the Roman Empire, as the extremely rich withdraw from bearing their share of the tax burden, while siphoning off an increasingly greater portion of public resources. In the Roman Empire the aquaducts, which were intended to supply the public with water, were tapped and siphoned off by the aristocracy for themselves. This treat provides another point of similarity with the later Roman Empire. After the defeat of Carthage, the senatorial aristocracy massively expanded their wealth, power and property at the expense of the Roman citizenry, who had previously been the backbone of the Roman republic. These immensely wealthy men acquired massive latifundia – estates worked by slaves – across the Roman Empire, and particularly in North Africa. One of the less-known causes of Boadicea’s revolt was Seneca’s withdrawal of 2 million sesterces from the British economy. As a result, the status of the plebs – the non-aristocratic, free Roman citizens became depressed until there was little legal distinction between them and slaves. This free trade agreement, and its provision for the use of cheap migrant labour to lower wages across the EU, appears ready to do the same today. The only difference is that the migrant workers are in theory economically free, though if Osborne and Cameron get their way they will be deprived of the access to the free healthcare and other welfare services currently held – but probably not for very long – by the host population. The intentions and effects will be similar, though instead of Roman aristocrats the people controlling and benefitting from these new trade agreements will be international corporations. I can remember an old text book we had at school in geography in the second year about the EEC, or Common Market as it then was. This explicitly attacked the accusation of the Soviet bloc that the Common Market was established to exploit the European worker. Well, there was enough of the exploitation of the workers in eastern Europe under Communism. However, just because the Soviet counterpart to the EU, COMECON, was worse doesn’t mean that they didn’t have a point. It may not have been true then, but if this trade agreement goes through, the Soviet description of the EEC will certainly have more than a little truth. Here is a good article, written by one of the first people to alert us to TTIP: http://www.chartist.org.uk/articles/europe/sept13kaucher.htm . It was used in this article: http://www.newstatesman.com/politics/2013/12/how-eu-making-nhs-privatisation-permanent . Then there is this, by Ms Kaucher, from the day one: http://www.opendemocracy.net/ournhs/linda-kaucher/real-force-behind-nhs-act-euus-trade-agreement . Then this: http://trade.ec.europa.eu/doclib/press/index.cfm?id=988 . I might have more. Here’s an article about the TTIP/TAFTA agreement. It makes for some scary stuff. One article on how TTIP might work, soon http://www.just-auto.com/news/vda-stresses-us-europe-ttip-deal-before-obama-leaves-office_id141768.aspx . One more, with perhaps more to come: http://www.salon.com/2014/01/15/leaked_tpp_documents_administration_may_give_up_key_environmental_protections/ . Final link, put online late yesterday evening http://www.commondreams.org/headline/2014/01/15 . I was discussing the TTIP with a friend this evening and he raised a good point: This deal will cause a huge amount of trouble for British businesses, who may find themselves being trodden on by the multinationals. What national government would wish to be seen as actively going out of its way to harm business? This may be an argument on which opponents of TTIP can build. Would anyone like to put forward an opinion on that? Mike, huge thanks for the work you’re doing highlighting TTIP and how it will destroy our culture here in the UK. Its effects will be lethal, and will include the end of the NHS.Yes, it will cause a massive amount of trouble for British businesses, who will lose out to the multinationals. But in my view that could never be more than a tangent to the core argument that TTIP is just wrong – because government and with that any remnants of public provision for the common good will be immediately trampled to death. I did write a very considered response to this however login problems lost it all.. I have been rather angered by this sneaky and significant assault on most of us. I am writing to you in order to express my very grave concerns I have regarding the implementation of TTIP. The profile of this enormously significant issue seems to be worryingly under played in the media and in Parliament. I believe that, if allowed to complete, this agreement will devastate the living standards of the entire working population. It will emasculate government from defending its own people, bolster further the malign power of multi nationals, destroy real competition and have a highly negative effect upon the environment of the UK and the rest of Europe. I do not feel that my assertations are hyperbole. The whole thing seems to be progressing secretively until it becomes a fait accompli. I am not someone who writes to my representatives as a rule however this, in my view, rather sinister and potentially disastrous agreement must be stopped. I am sure many will trumpet an economic benefit. I do not believe that that benefit, if such it be, will be felt by the common people. Their quality of life and basic freedoms are threatened directly, their wages will fall, the essentials of life will be under corporate control and therefore delivered for profit, not for the benefit of the people. I would be interested in your views on this. My sincere wish is that it is stopped entirely. Could I direct you the blog below? I am in complete agreement with it”. As a committed letter-writer myself, I have to say that this is an excellent piece of correspondence. I have never written to my MP, politicians have always seemed to irrelevant to me. Today I will write to Teresa May. If you don’t mind, James Bogie, I might copy the bulk of your letter. They have sold the country’s assets off now they are selling the people out . I find it strange that even self serving gov’s like we have now, in the UK, would like 2 render itself powerless..IC similarities & have 4 many years w/ movies like, Bladerunner, Escape 2 LA,Snake Eyes & WaterWorld. Why would any gov, tho many African nations,have created, cities that R like, the gated rich communities w/ armed security guards & the rest ghettos,when U can have a well developed & educated community. What’s happened to all the assassins like we used to have in the good old days? I don’t care. Resorting to crime is not the answer; those who did so would become as bad as their enemies. I was not seriously advocating political assassinations, more pondering its curious historical demise. I would much rather political criminals justly received lifetime jail sentences. Anyway, beside the point, sorry. Thank you for your reporting. I definitely agree with opposing these trade agreements. Though Philip Morris and plain packaging are a bad example and not comparable to lead in a toy. They should win, not because plain packaging will reduce cigarette sales, as that is not particularly likely, but because the Australian government deserves a good kicking for this and other nanny state laws. We have to come together with this, otherwise we will no longer exist as a person but as a number! Questions must be raised about the integrity of our politicians, they are all in it together. As a poster above stated these agreements have been years in the making, someone in office and opposition must have known the back ground to the details. It really is just down to us, the Labour Party was at one time the defender of peoples rights, we can no longer rely on them and they are as neo-liberal as the Tories. I have tried in the past years to warn fellow Labour members who bury their heads in the sand that the leadership can’t be trusted, only to be shouted down for speaking out, this misplaced loyalty will destroy the party not build it. We have got to get rid of the current stock of MPs although I want to retain certain ones such as John McDonnell. The local candidates here where I live really won’t fight our corner, they duck and dive in order to stay on message, that is not what we need at this stage of the game, we need vision, integrity, and real political conviction. In the final analysis we can reject agreements that we are not party to, whatever the feral elite think. “……..calling for the completion of a ‘free trade’ agreement with the United States of America that will end democracy as we know it today.” Who are they ‘calling on’, surely not the people of this country! “This Trade Agreement has been fast tracked because no elected, democratic government would give it consideration. Would they?” This is a government that has no mandate from the people, is in fact a dictatorship, so why should we expect democratic policies from them? This insidious fascist bunch of arrogant privileged sociopaths is bringing the people and this country to their knees. They have forced a program of legislation on the people of this country. None of which has been voted on by the people. Being a Coalition they have no Manifesto that the people can question, and therefore have no mandatory right to decide on legislation without the consent of the people. All their legislation has been decided on their own say so, with no recourse to common law and peoples’ innate rights. Hi Mike. Thanks for writing this. As it’s so important to get this message across, I’ve adapted it for people who don’t know all the technical terms. I would like to run it by you first before I make it public so please let me know if you’re ok with my version. Your article seems so different as to be a completely separate piece of work – perhaps based on mine but not identifiable as mine. I can’t say I’m enamoured of it but you can certainly use it. Well as I said I wanted to write a version that was more readable for the lay person. It does use quite a few of points you raised but if you have no problem with me publishing it, I’ll do so. Thanks. I understood (from ALTEREU I think) that the €500 Osborne quoted was not pa but an estimate for the 10 yrs from 2017 ie about 80p per wk. Also I’m not sure that it can become “illegal” for a country to leave the EU or TTIP. I gained my MA in International Relations in 1968 so I’m willing to be corrected but International Law is BETWEEN countries & organisations NOT above them ( unlike domestic law which is ABOVE citizens). There is nothing to stop a country leaving a group, breaking an agreement or disregarding a law if it so wishes. I admit there would be consequences but all it needs is the will & the guts. There are already plenty of examples. Here is an excellent summary, by the trade expert who alerted many to the dangers of TTIP http://occupylondon.org.uk/information-kit-useu-transatlantic-trade-and-investment-partnership-ttip/ . Here is some information, with links, of another trade deal, TISA, Trade in Services Agreement. It will be closely related to TTIP and TTP. Putting all these and more together might well be a main reason for the doctrine of Regulatory Coherence. https://www.techdirt.com/articles/20140428/10593427051/meet-tisa-another-major-treaty-negotiated-secret-alongside-tpp-ttip.shtml . TISA was studied by the large Public Services International (PSI), a group of civil service organisations, e.g. unions. PSI’s document is here: http://www.world-psi.org/sites/default/files/documents/research/en_tisaresearchpaper_final_web.pdf . Getting back to TTIP, here is its official announcement. I am almost certain that this is a near reproduction of the approved Mandate of the High Level Working Group organised to advise the European Commission. It’s membership seemed to change and nobody I know succeeded in finding membership lists: http://www.ustr.gov/about-us/press-office/reports-and-publications/2013/final-report-us-eu-hlwg . I forgot this one: http://www.waronwant.org/attachments/HILARY_LONDON_FINAL_WEB.pdf . Here is the official statement of the crucial Regulatory Coherence doctrine, a way of changing rules of TTIP to meet future goals and situations. http://www.bilaterals.org/?eu-us-fta-regulatory-coherence . Download it from here.